MS Kong Harald: in English "King Harald". Named after Norway's reigning King, Harald V.
MS Nordlys: is Norwegian for Aurora borealis (northern lights). MS Nordkapp: Norwegian for North Cape. MS Nordnorge: Norwegian for North Norway. MS Richard With: named after the Norwegian captain and businessman who in 1881 founded what later came to be know as Hurtigruten. MS Polarlys: Norwegian for "Polar lights", meaning the same as Nordlys. MS Fram: is named after the expedition ship used by the famous Norwegian explorers Fridtjof Nansen and Roald Amundsen. "Fram" means "Forward". MS Finnmarken: is Named after the northernmost county of Norway, Finnmark. MS Midnatsol: is Norwegian for Midnight sun. MS Trollfjord: is named after a very narrow fjord which is famous for its steep-sided mountains. The name means "The fjord of the troll". 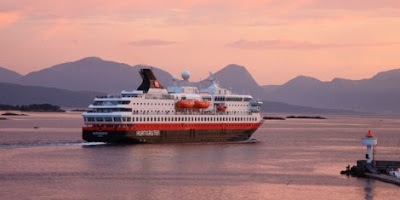 MS Vesterålen: is named after an archipelago in Northern Norway, just north of Lofoten. Written by Skipskatta time: 10:51 a.m.
MS Kong Harald's restaurant has no concern for environment. Every day a huge quantity of plastic bottles are wasted as the restaurant refuses to offer water from the tap (as any restaurant in the world would do) but compels us to buy small bottles of water. It is both and environmental and a commercial scandal.